ales "" & is zhaw mitarbeiter: "zhaw_staff"
Two groups of MBA students visited the SML in March as part of a customized study trip. During these one-week intensive programs, completely tailored to customers’ needs, students were presented with a balanced program of lectures, company visits, networking and cultural events. SML was delighted to welcome back Hong Kong Baptist University (HKBU), a longtime partner school, for another study trip to Switzerland. After two successful events in 2015 and 2016, this was the third MBA group hosted by the SML from 5 to 9 March. With 40 students and three faculty members, it was also the largest group to date. For the majority of the participants, it was their first experience of Europe. 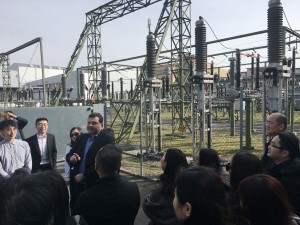 In addition to delivering academic content and providing practical relevance through company visits, the SML also scheduled time for cultural exchange and shared experiences. The particular challenge was to show Switzerland as both innovative and traditional: Innovation was a key topic throughout and was approached in various ways during each of the five company visits. 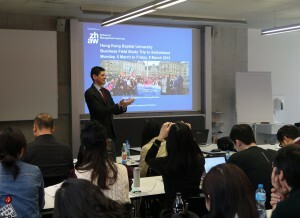 A highlight of the HKBU program was a visit to the Swisscom Business Innovation Campus: During an entire morning, participants learned how Swisscom drives innovation and how it has made it into the top three of the most innovative Swiss companies (according to a 2017 study by the University of St. Gallen, htp St.Gallen, and Scholz & Friends). The visit was hosted by John Rice, Innovation Manager at Swisscom, with 10 Swisscom apprentices in support. They had been given the chance to plan the visit as their project and had put together an extremely interesting and extensive program. In various workshops and product demonstrations, topics such as virtual reality, WorkSmart systems, artificial intelligence, and double robotics were presented and made available to self-experience for the participants. 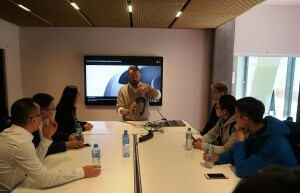 Students were allowed to test the Microsoft HoloLens – augmented reality glasses already in use by Swisscom field service technicians to help them in installing routers and doing maintenance work at their customers’ premises. The device dispenses with the need for lengthy training: All the information the technicians need to perform the individual work steps is displayed directly in their field of vision. A demonstration of the double robot was also impressive: a modern telepresence system that opens up completely new possibilities for interaction between employees, customers, and business partners at a global level. In contrast to traditional video conferencing, where only one screen is visible, double robotics allows the user to move freely in a room. 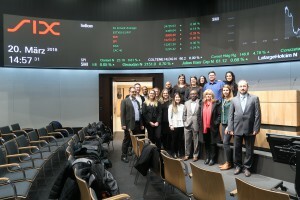 During the week, students also visited companies in the energy sector (ABB), mechanical engineering (Winterthur Gas & Diesel), banking (UBS), luxury hotels (Les Trois Rois, Basel) and chocolate production (Idilio Origins). These events were closely interlinked with lectures at the SML on the topics including Luxury Management, Risk Management, and Innovation & Entrepreneurship. 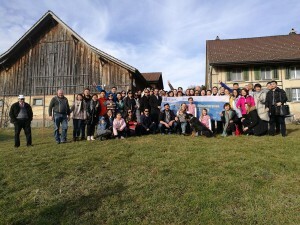 The students from HKBU also had the opportunity to experience rural Switzerland. The SML arranged a visit to a farm near Wetzikon as a cultural event. 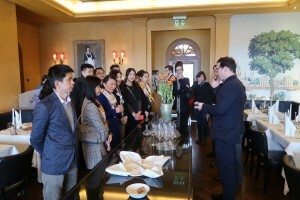 It was sponsored by swissmooh, the sales organization of the Mooh cooperative and exporter of Swiss dairy products to China. The Auer family first took participants on a tour of their farm, providing their guests with information about the products, production processes, and techniques of a modern dairy farm. 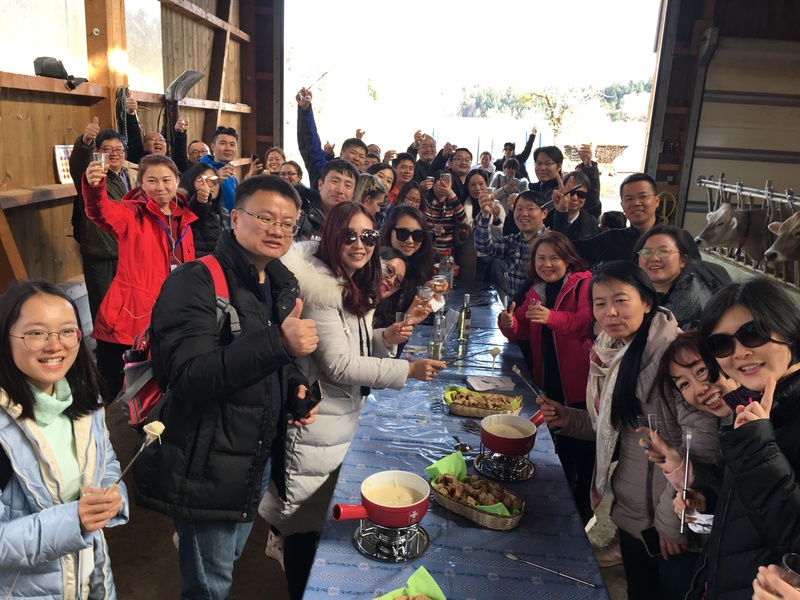 After the informative tour (with Chinese-language translation), the visitors were invited to taste the farm’s fondue and raclette – accompanied by Alphorn music. Every participant received one of the small raclette ovens as a gift – a highly popular souvenir for family and friends in China. It was a real Swiss experience. The second group visiting us for another weeklong program in March were MBA students from DePaul University Chicago. At their home university they follow a customized MBA program, which is completely tailored to the requirements of their employer, a regional U.S. bank. Their classes are also held at the workplace: DePaul faculty members teach at the company several evenings a week to enable participants to combine their studies and job duties as efficiently as possible. 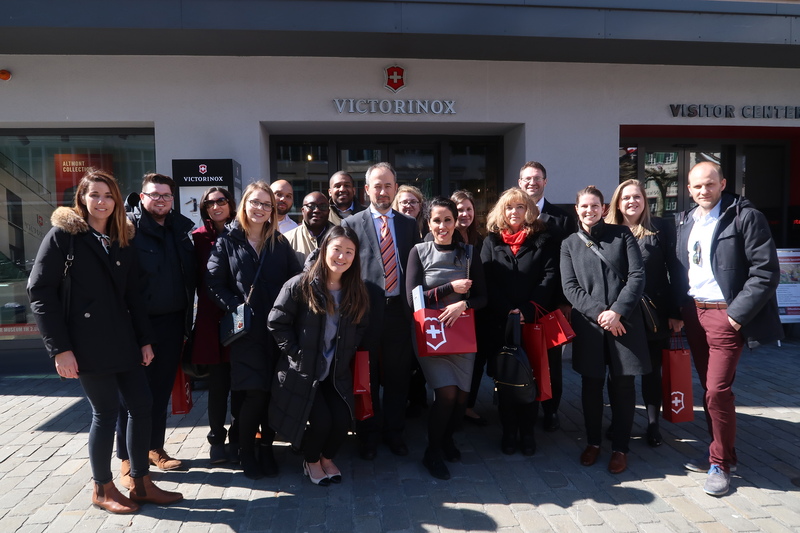 The study trip at SML provided the participants with in-depth knowledge about the Swiss Economy and Culture, adding to it different banking and finance related topics. An introduction to the Swiss banking system by Prof. Dr. Suzanne Ziegler, Head of the Department of Banking, Finance, Insurance at the SML, was followed by presentations and workshops on the topics of anti-money laundering, CSR in finance, hedge funds, and alternative risk. Spiros Margaris, leading Fintech influencer and venture capitalist, had been invited as an external guest speaker to share his views on “Fintech Trends”. 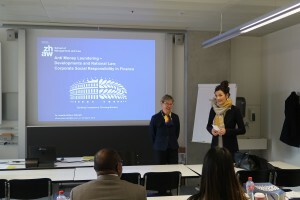 Prof. Isabelle Zulauf-Poli, welcoming guest lecturer Dr. Annette Althaus-Stämpfli, business lawyer and bank council. 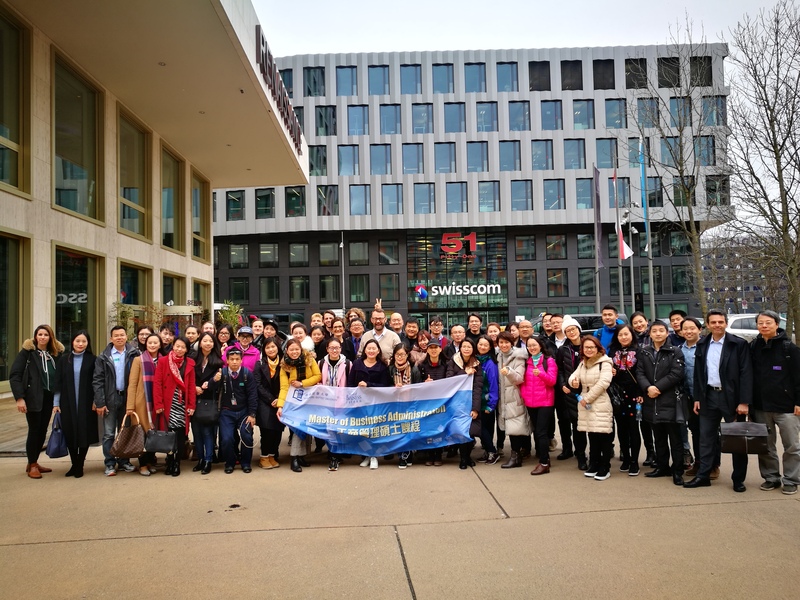 As requested by the group, company visits included not only visits to financial institutions such as the SIX Stock Exchange and UBS, but also to the Schaffhausen watch manufacturer IWC and the world-famous Swiss army knife producer Victorinox. It was these two visits to companies from outside the finance sector, in particular, that made a lasting impression on participants: They particularly praised the precision, highest quality standards, and restrained modesty of the two brands despite their international success.